Forests are generally known specifically for their living trees. The tall pillars, their stout trunks reaching for the sky, the branching canopies casting shade on the ground below – they are the very definition of forest, and without them the forest would not exist. And yet, the living trees are only a small part of what forms a forest. Just as vital are the dead trees, the ones still standing as snags and, perhaps more importantly, the ones that have fallen as logs. Logs play a vital role in the forest ecosystem. As they begin to break down and decompose, they return nutrients back to the soil that may have been locked up in that tree for decades, or even hundreds of years. Because they’re essentially nutrient-rich piles of fertilizer, they provide excellent spots for new life to grow. Often in the tropics, where the majority of the nutrients in the ecosystem are contained within the living matter, fallen trees are swarmed by young plantlings looking for a good start in life. It’s not unusual to have trouble seeing the log for all the little trees and plants growing on it. Such is not usually the case in the temperate north here, but they do still foster growth, often moss or fungus, sometimes ferns or grasses, occasionally young trees. Rolling a log over can reveal many secrets. They are home to many critters, from vertebrates like salamanders or frogs that hide underneath, to insects and invertebrates that tunnel below or inside. These latter groups are an important part of the decomposition process, breaking it down into pieces that are easier for bacteria and little organisms to digest. 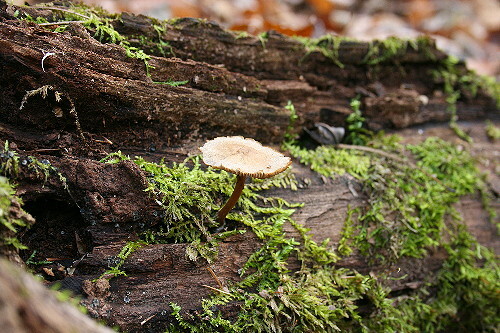 The longer a log has been down, the further along the decomposition process as all the little critters get to work. A newly-fallen log is still strong enough to support a person’s weight, but do the same with one that’s been on the ground a number of years and your foot will go right through it. The amount of time it takes for a log to break down completely varies according to the size, density and composition of the wood and the local conditions. 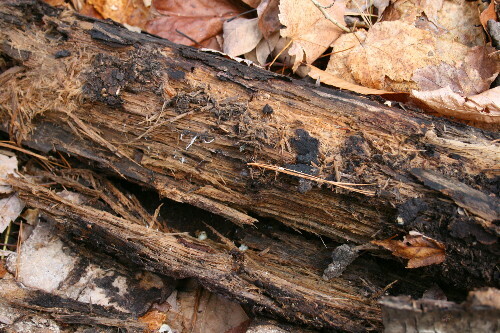 Dry and cold conditions tend to slow the decomposition process, as the organisms responsible for much of the cycle are less active, and denser wood will take longer to rot (even within the same tree, sometimes, different densities between the sapwood and the heartwood can create hollow logs, or logs where just the centre remains). A giant red cedar, which has a dense, oily wood, may take a century to completely return to the soil. I wrote about carpenter ants before, but there are many species of invertebrates that also call dead trees and logs home, and which woodpeckers find tasty. 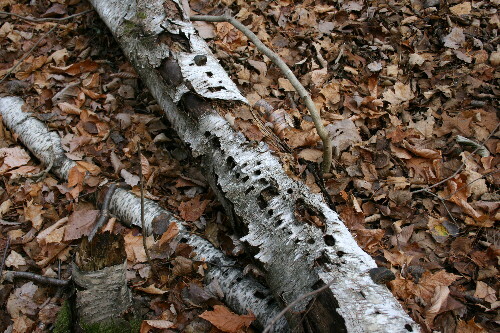 Fallen logs are riddled with woodpecker holes just as often as standing snags are, and it’s not unusual to flush a Pileated or other woodpecker up from what seems like the forest floor. Woodpeckers, and Pileateds specifically, probably help in breaking logs down as they chip pieces off during their excavations. Woodpeckers aren’t the only birds to use logs, though. Ruffed Grouse males will sit atop a large log to perform their drumming displays, where they beat their wings rapidly to create a deep staccato beat, using the log to amplify the sound’s acoustics. Many species of ground-nesting birds will build their nests under the overhang of a fallen log. Forests go through different stages of maturity, and one of the characteristics of a mature forest is the presence of many fallen logs. 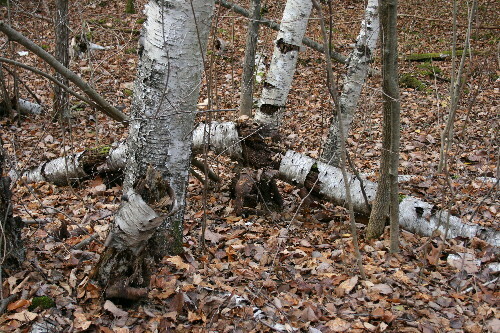 A truly mature forest, however, not only has fallen logs, but also has fully decomposed logs. Because the latter no longer look like logs, they can be hard to spot. In walking the woods around here I spent some time searching for a fully-decomposed log to take a photo of, but the forest is too young. I suspect much of the land around here was cleared for farming at one time or another, as there is evidence of split-rail fences that apparently run through the middle of the forest. It could be that the forest in this area is only about 60 or 70 years old. Certainly the really thick, tall, craggy trees that characterize a very old forest are few and far between. I found a couple that might possibly have been an old log or stump but couldn’t say for sure. The above was one (it’s quite difficult to get a photograph that adequately conveys the sense of a bump in the land, it turns out). These old, decomposed logs show up on the forest floor as raised hummocks. Often they’re long and narrow, much like the log they used to resemble. They can be mistaken for burial mounds, as they have the same sort of formation. Oftentimes you can see two or three trees growing in a line along the hummock, evidence of seedlings that got their start on the decomposing log, now long gone. 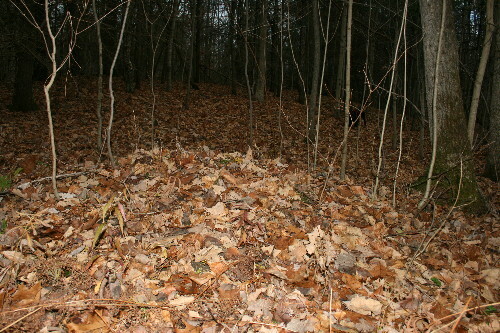 Because of the amount of time necessary to return a grown tree back to the forest floor, these hummocks are often used as a sign of forest maturity. Logs are good for having fun, too. Children use them as balance beams. Small ones can be used to create forts. Hollow ones can be crawled through as tunnels, or lived in like treehouses. And I know one puppy who had a blast vaulting over them like agility jumps. My mum used to occasionally amuse herself in their old place by going up the hill and pushing over the punky birch trees. I didn’t know that woodpeckers are just as comfortable on flat surfaces as they are on tree trunks. Love the picture of Raven with her ears up! What a lovely forest story — it makes me want to take a long meander throught the woods. I always enjoy looking for interesting moss, mushrooms and other fungi, but I rarely disturb fallen trees because the sudden scattering of uncovered critters spooks me! 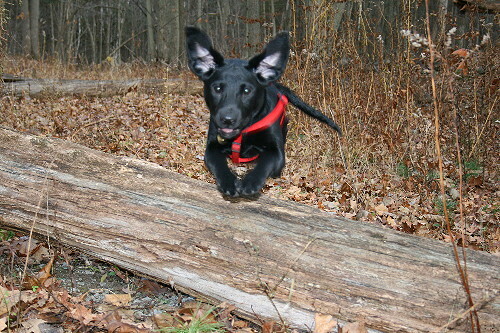 Great photo of Raven flying over that log, by the way! There certainly are some creepy critters under logs, Eyegillian, I have to agree. Though you can find some pretty neat stuff, too, if you’re lucky. Next Next post: The Dark is Rising – or is it?